On this, my first September 11th back in America, the post I am writing is a departure from this blog’s usual content, but today is a day unlike others. What happened on this day twelve years ago changed the face of our nation. Over a decade later, we live in a world different in attitude and spirit than the world before 9/11 – less innocent, less ingenuous. However, the inevitable consequence of loss is the strong and poignant realization of the value of the things we have. The dreams that this, our nation, embodies are precious beyond belief, and despite everything we still stand as a symbol of hope for people in countries where oppression is a way of life and freedom of thought, let alone freedom of speech, is almost unimaginable. We lost much on 9/11, and I will never forget. At the time, I was living in New York’s East Village, one block from where the above photograph was taken. From that street corner there was a clear view of the World Trade Center towers. I will never forget the horror of that morning, but neither will I ever forget the aftermath. In the days that followed, my neighborhood became a community. I spent my days talking to total strangers as though they were friends. The sense of common grief quickly transformed into a feeling of common determination, a conviction that not even a tragedy so great could bring down our marvelous city. On television and in the newspapers, I watched that feeling of camaraderie spread like ripples from every place that horrific day had affected, every family touched by the unthinkable. In 2004, after having lived six years in New York, I moved back overseas, to Europe, where I had spent most of my childhood and adolescence. Nine years later I have come back to find a country divided as I have never seen it before. I wonder what happened to the sentiment that filled us all on that terrible morning – that sense that we are all Americans, that we can rise above ideological differences that cannot draw as black and white a division as the proponents of either side seems to think. Our common values are stronger than that. We are better than that. It is a sad truth of the human condition that it often takes a tragedy on such a scale to bring us together, to remind us that we all share a common bond. A year after 9/11, the mural you can see above went up on the wall on that street corner near my house, where I had stood when it began. 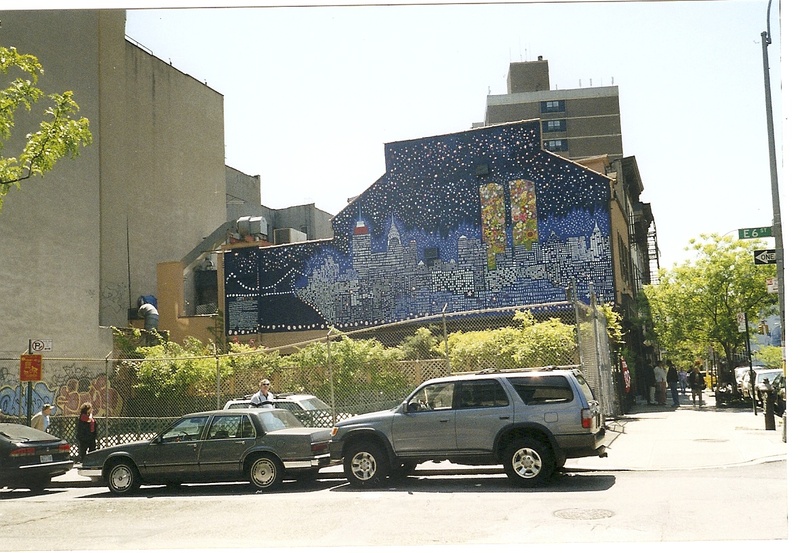 In all these years, I have held the image of that mural in my memory, a beautiful tribute to the victims of that day, the bright flowers and twinkling stars as sweet as the innocence we lost, reminding us of what is precious, of what is still ours. This entry was posted in Explorations and tagged New York, September 11 2001, World Trade Center. Bookmark the permalink. You know, Nancy, every foreigner I’ve ever spoken to who has lived in America, however briefly, has commented specifically on that – the way we look out for our neighbors here, take care of the people in our communities and make newcomers feel welcome. That lack of indifference and sense of solidarity with each other should be greater than any political and ideological difference, and it’s a big part of what makes this country a wonderful place. Spontaneous acts of kindness on the part of acquaintances and strangers alike are a part of our culture and I never tired of telling people about that aspect of life in America when I was living overseas. Not that people aren’t kind elsewhere, but we take it to a point that others sometimes see as naive or ingenuous. For my part, I believe it’s a quality we should try very hard not to lose. Thanks for reading!